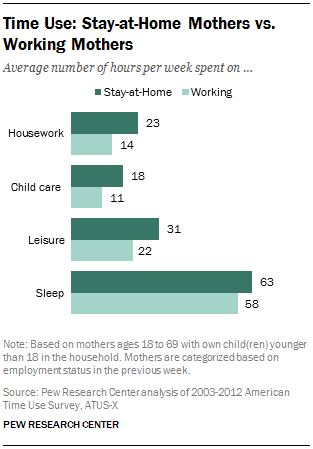 Mothers who are not working for pay spend more time, on average, on child care and housework than do working mothers, but they also have more time for leisure and sleep, according to a new Pew Research analysis of pooled data from the 2003-2012 American Time Use Survey. 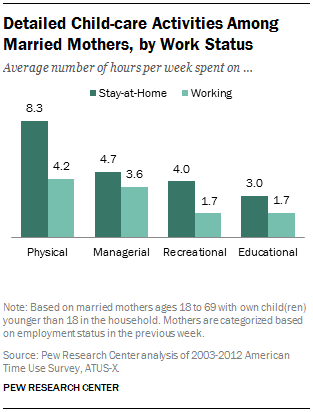 Among all stay-at-home mothers, time-use patterns vary considerably by marital status. Married stay-at-home mothers with working husbands spend more time on child care than do single mothers who are at home (20 hours per week vs. 15 hours).16 They also spend more time doing housework. These married stay-at-home mothers have less leisure time than their single counterparts (29 hours per week vs. 35 hours). The total time cohabiting stay-at-home mothers spend on home activities falls in between that of married mothers and single mothers. For example, their child-care time is slightly less than that of married mothers (19 hours per week vs. 20 hours), but more than that of single mothers (15 hours per week). The child-care time gap between working and stay-at-home mothers is largest among married mothers. Married stay-at-home mothers spend an average of 20 hours per week on child care, nine hours more than married working mothers. By contrast, single stay-at-home mothers spend about 15 hours per week taking care of their children, only about five hours more than single working mothers. One important factor related to mothers’ time use is the age of their children. Younger children create greater demands on their parents’ time. Among married stay-at-home mothers, those with children ages 5 or younger spend twice as much time on child-care activities as do those with older children (25 hours per week vs. 12 hours). At the same time, stay-at-home mothers with younger children do somewhat less housework than their counterparts with older children (24 hours per week vs. 27 hours). 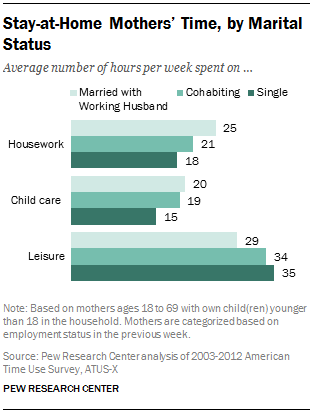 Married stay-at-home mothers have more leisure time when their children are older. Those with school-age children have an average of four more hours per week of leisure time than those with children ages 5 or younger (31 hours per week vs. 27 hours per week). The same pattern can be seen with married working mothers. Those with younger children spend more than twice as much time on child-care activities as do mothers with children age 6 or older (16 hours per week vs. 7 hours). Their time doing housework is also somewhat lower (14 hours per week vs. 16 hours). The number of children in a family also affects parents’ child-care time. Married stay-at-home mothers with two children younger than 18 spend more time than those with one child on child-care activities (20 hours per week vs. 16 hours), and married stay-at-home mothers with three or more children spend even more time on child-care activities—23 hours per week. This pattern applies to married working mothers as well: Those with two children spend about three hours more on child-care activities than mothers with one child (12 hours per week vs. nine hours), and those with three or more children spend 14 hours per week on child care. Single mothers’ child-care time also is affected by children’s characteristics. (There is not a large enough sample of cohabiting mothers to report on their time use at this level of detail.) Stay-at-home single mothers with children ages 5 or younger spend about twice as much time on child care as their counterparts with older children (19 hours per week vs. 10 hours). There is a similar gap among working single mothers—those with young children spend 14 hours per week on child care, compared with seven hours among those with school-age children. Single stay-at-home mothers with three or more children spend an average of 20 hours per week on child care, significantly more than their counterparts with one or two children (11 hours per week and 17 hours per week, respectively). Working single mothers’ child-care time also increases by the number of children they have. Single mothers who work for pay spend an average of eight hours per week on child care if they have one child, 11 hours if they have two children and 13 hours if they have three or more. The amount of time married stay-at-home mothers spend with their children differs significantly by education, race and ethnicity. College-educated stay-at-home mothers who are married spend more time on child care than their less-educated counterparts—an average of 24 hours per week. By comparison, mothers with some college education spend 19 hours per week on child care, and mothers with a high school education or less spend 17 hours per week. Asian and white married stay-at-home mothers record more time with their children than their counterparts who are black or Hispanic. On average, married stay-at-home Asian mothers spend 23 hours per week on child-care activities, and married stay-at-home white mothers spend 21 hours per week. By contrast, Hispanic married stay-at-home mothers spend about 17 hours per week on those activities, and black mothers who are married and staying at home with their children spend 16 hours per week on child care. Among single stay-at-home mothers, those who are college-educated spend more time on child-care activities than do mothers without a college degree (17 hours per week vs. 15 hours). However, among working single mothers, education doesn’t make a difference in their child-care time. Single mothers who work for pay spend about 10 hours per week on child care, whether they have a college education or a high school education. The racial differences in child-care time among single mothers are smaller than they are among married mothers. White single mothers who are at home on average devote about one hour more to child care than do Hispanic mothers (16 hours per week vs. 15 hours), and two hours more than black mothers (14 hours per week). Black single working mothers spend slightly less time on child-care activities than their counterparts in other racial and ethnicity groups (nine hours per week vs. 10 hours). There is not a large enough sample of Asian single mothers to report on their time use at this level of detail. Aside from differences in the amount of time stay-at-home mothers and working mothers spend with their children, there are differences in the types of activities in which each group engages. The data can be broken down into four broad categories of child-care activities: physical, managerial, recreational and educational.17 Physical care includes activities such as changing diapers, feeding or dressing a child, and care related to children’s health. Recreational care includes activities such as playing games or sports with children. Educational activities include reading or helping with homework. And managerial activities related to child care include organizing and planning for children, attending events and the like. 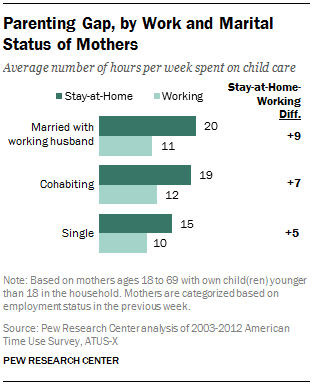 Married stay-at-home mothers spend more time than their working counterparts in each of these areas. The gap is larger for physical, recreational and educational activities; married stay-at-home mothers spend about twice as much time in these activities as do working mothers. The smallest gap is in managerial activities, where working mothers do 77% of what the stay-at-home mothers do. For both groups of mothers, physical child-care activities take up the largest share of their child-care time. This is especially true for married stay-at-home mothers: about 42% of their child-care time is spent on taking care of children’s physical needs. Among married working mothers, 37% of their child-care time is spent on physical care. Single mothers who are at home also spend about twice as much time in physical care as their counterparts who work for pay (6.6 hours per week vs. 3.4 hours). But the two groups of mothers spend similar amounts of time in managerial child-care activities (3.6 hours per week vs. 3.3 hours). The gaps in educational or recreational activities among single mothers are not as large as those observed among married mothers. For stay-at-home single mothers, 2.1 hours per week are spent on educational activities with their children, compared with 1.6 hours among working single mothers. And stay-at-home single mothers spend 2.5 hours per week on recreational activities with their children, compared with 1.5 hours among working single mothers.